For centuries, civilisations have used print media to spread news and information to the masses. The Roman Acta Diurna, appearing around 59 B.C, is the earliest recorded "newspaper." 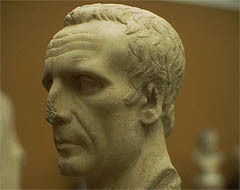 Julius Caesar, wanting to inform the public about important social and political happenings, ordered upcoming events posted in major cities. Written on large white boards and displayed in popular places like the Baths, the Acta kept citizens informed about government scandals, military campaigns, trials and executions. In 8th century China, the first newspapers appeared as hand-written newsheets in Beijing. 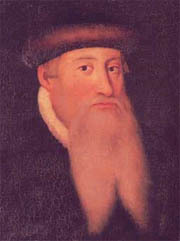 The printing press, invented by Johann Gutenberg in 1447, ushered in the era of the modern newspaper. Gutenberg's machine enabled the free exchange of ideas and the spread of knowledge — themes that would define Renaissance Europe. During this era, newsletters supplied a growing merchant class with news relevant to trade and commerce. Manuscript newssheets were being circulated in German cities by the late 15th century. These pamphlets were often highly sensationalized; one reported on the abuse that Germans in Transylvania were suffering at the hands of Vlad TsepesDrakul, also known as Count Dracula. In 1556 the Venetian government published Notizie scritte, for which readers paid a small coin, or "gazetta." In the first half of the 17th century, newspapers began to appear as regular and frequent publications. 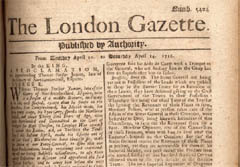 The first modern newspapers were products of western European countries like Germany (publishing Avisa Relation oder Zeitung in 1609), France (Gazette in 1631), Belgium (Nieuwe Tijdingen in 1616) and England (the London Gazette, founded in 1665, is still published as a court journal). These periodicals consisted mainly of news items from Europe, and occasionally included information from America or Asia. They rarely covered domestic issues; instead English papers reported on French military blunders while French papers covered the latest British royal scandal. Newspaper content began to shift toward more local issues in the latter half of the 17th century. Still, censorship was widespread and newspapers were rarely permitted to discuss events that might incite citizens to opposition. 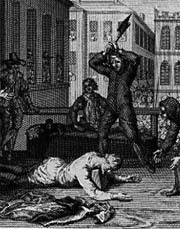 Newspaper headlines did announce the beheading of Charles I at the end of the English Civil War, although Oliver Cromwell tried to suppress all newsbooks on the eve of the execution. In 1766, Sweden was the first country to pass a law protecting press freedom. The invention of the telegraph in 1844 transformed print media. Now information could be transferred within a matter of minutes, allowing for more timely, relevant reporting. Newspapers were appearing in societies around the world. Japan's first daily newspaper, Yokohama Mainichi Shimbun, appeared in 1870 (although printing from movable type was introduced in Japan in the late 16th century). By the middle of the 19th century, newspapers were becoming the primary means of disseminating and receiving information. Between 1890 to 1920, the period known as the "golden age" of print media, media barons such as William Randolph Hearst, Joseph Pulitzer, and Lord Northcliffe built huge publishing empires. These men had enormous influence within the media industry, and gained notoriety for the ways in which they wielded their power. Newspapers have also played a role as disseminators of revolutionary propaganda. 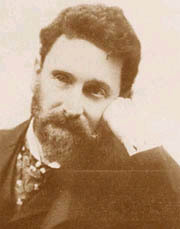 Iskra (The Spark), published by Lenin in 1900, is one notable example. On June 21, 1925, Thanh Nien made its debut in Vietnam, introducing Marxism to the country and providing information on the revolution's strategic policies. Broadcast radio exploded onto the media scene in the 1920's. Newspapers were forced to re-evaluate their role as society's primary information provider. Like the new media technologies of today, the development of a low cost, alternative media source produced rumblings that radio would topple the newspaper industry. To respond to this new competition, editors revamped the paper's format and content in order to broaden their appeal, and stories were expanded to provide more in depth coverage. No sooner had newspapers adapted to radio than they were forced to re-evaluate themselves in light of a new and more powerful medium: television. Between 1940 and 1990, newspaper circulation in America dropped from one newspaper for every two adults to one for every three adults. Despite this sharp decline, television's omnipresence did not render the newspaper obsolete. Some newspapers, like USA Today, responded to the technological advancements by using color and by utilizing the "short, quick and to the point" stories that are usually featured on television. The technological revolution of today is creating new challenges and opportunities for traditional media. Never before has so much information been so accessible to so many. By the end of the 1990s, some 700 had web sites; today there are thousands. The amount and immediacy of information on the Internet is unparalleled, but it has not signalled the end of the newspaper's relevance. 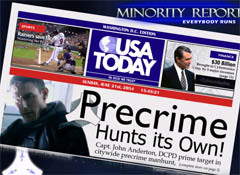 Newspapers in print remain a popular and powerful medium for the reporting and analysis of events that shape our lives. WAN estimates that one billion people in the world read a newspaper every day! The above article is from World Association of Newspapers.